Cory Booker to the Rescue, Again? 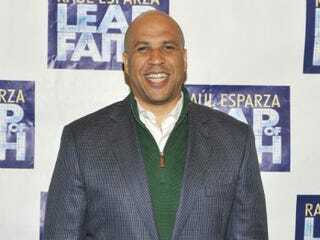 Earlier this year, Newark, N.J., Mayor Cory Booker was the subject of national attention when he rescued a neighbor from a burning building. Has he done it again today, going beyond the call of political duty to save a citizen's life? Hold the accolades. The superhero mayor was more of a concerned bystander this time. When a pedestrian was struck by a moving vehicle in Newark earlier today, Mayor Cory Booker tweeted that he was among a group of people who "got man stabilized & into ambulance. He'll b OK. Thanx 2 all who helped"
Law enforcement officials said later it was Michael Davidson, a 19-year veteran of the Essex County Prosecutor's office who was first on the scene, and performed much of the heroism. "The detective immediately called 911 and began to render assistance," said Katherine Carter, a spokeswoman for the prosecutor's office. "He saw the victim was face down on the ground. He was bleeding from his mouth and nose. Det. Davidson got some tissues from his trunk and began to wipe away the blood."